There when you need it to keep your business working. Access your emails and data anywhere, any time from any device. Seamless VoIP and Wireless solutions to boost efficiency. Bubble wrap your business and protect your data the easy way. Living in a technology dependant world, once something goes wrong we’re back in the dark ages. DaMtech are here to keep your business working and deliver the right technology that suits the way you work. There’s no jargon at DaMtech, (unless you want to indulge us with your ‘tech talk’) the team offer plain English solutions so you know exactly what you’re getting. No more buying blind, you’re in control and you’ll get your IT Support and computer confusion sorted within no time. We understand tech goes wrong sometimes, things need updating or you might just press the wrong button; but we’re here to help keep your business going. Check out our range of services or just give us a call and we’ll have a chat. You’ll need to upgrade to Windows 10 to make sure you are secure. Get in touch for more info, and to discuss your options. 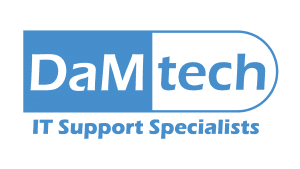 I have used DaMtech’s services on a number of occasions and each time they have come up tops when sorting out my IT challenges. They are extremely knowledgeable in all aspects of their work, very positive and focused, and really pleasant people to deal with. I wouldn’t hesitate to recommend DaMtech to my colleagues. DaMtech manage every aspect of our IT systems. This includes our server, our workstations, our VoIP services and our Office 365 accounts. We’re thrilled with how our productivity has improved once improvements were made to our IT systems. I would certainly recommend DaMtech to others. Let us know if you got an interesting project, or you’ve found yourself in an head-scratching moment and want to work together!